January | 2015 | Mommy. Foodie. Athlete. Remember how I said I follow a modified paleo diet? Well, peanut butter is just one of those things I am not willing to give up. 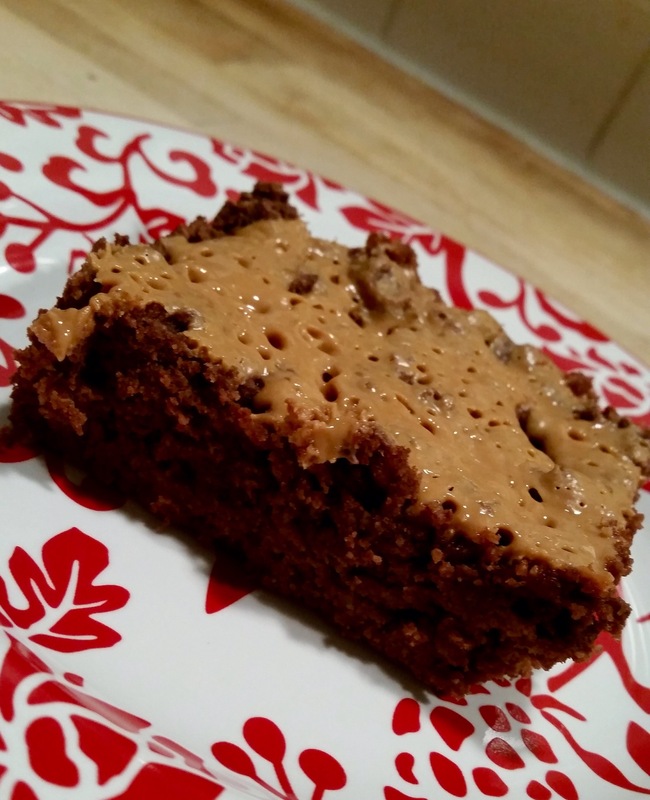 Are you following a strict paleo diet, go ahead and swap almond butter for the peanut butter! These are DANGEROUSLY good. While good for you, it’s taking things a bit extreme to finish off the pan in one sitting. Make sure you have an ice cold glass of almond milk to complete the experience! I’m not sharing this so people feel bad for me. I’m not sharing this so that people who keep tabs on me anonymously through the internet can gain knowledge of my personal story. I’m not sharing this because I am an expert. I am sharing this so that if someone finds themselves in my position, they know that there’s hope. I know that I needed hope. Growing up in a Portuguese family, rice was always a fabulous meal. It was so much more than the boil in a bag and eat with butter experience. My grandmother, mother, and aunts can whip up a rice dish without even thinking about it. Luckily, I have learned from the best! Instead of rice, I used quinoa. Depending where you look, there are different verdicts about whether or not quinoa is paleo. It seems like the majority of these sources place it in the “not paleo category”. Now, as I have said before, I am not following a strictly paleo diet. I make exceptions like peanut butter and soy products. I know what works for my body. 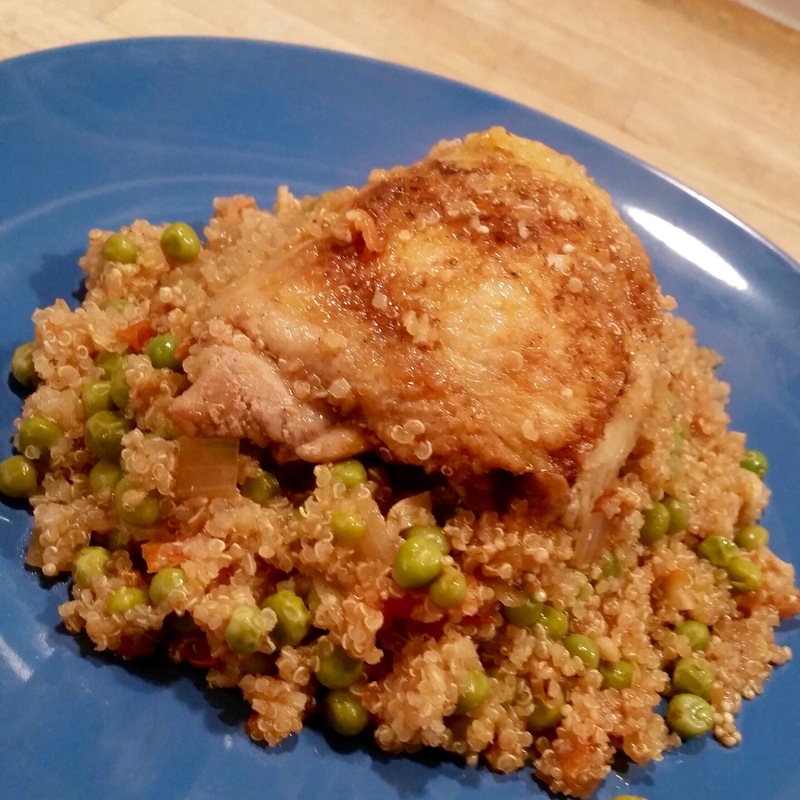 For me, quinoa is very satisfying, a good source of protein, and delish. It definitely doesn’t fall in the cheat meal category for me! With that being said, it’s up to you to figure out if you want eat it or not. Do some research and decide what works for you and your body! Before I became a cavegirl, pasta was my absolute favorite dish. Ok, who am I kidding, it IS still my favorite dish, I just don’t eat it. 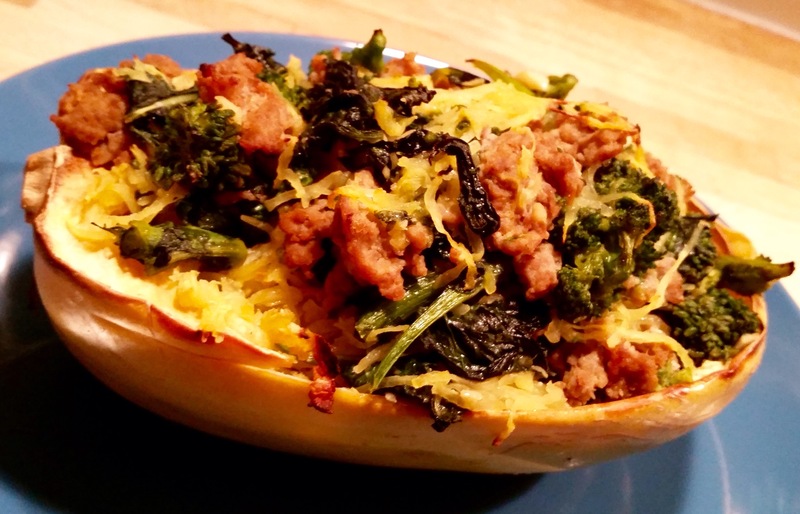 While you can’t go into a spaghetti squash meal anticipating a giant bowl of pasta in front of you, it sure does make a great substitute! By making it this way, it absorbs that incredible flavors from the sausage and broccoli rabe making for a VERY satisfying meal! One of the hardest parts about eating Paleo is watching the hubby eat treats without worrying about what they will do to his body. The only way to combat this jealousy is to make my own creations that I can completely enjoy knowing they are guilt free. Guilt free can also mean delicious! 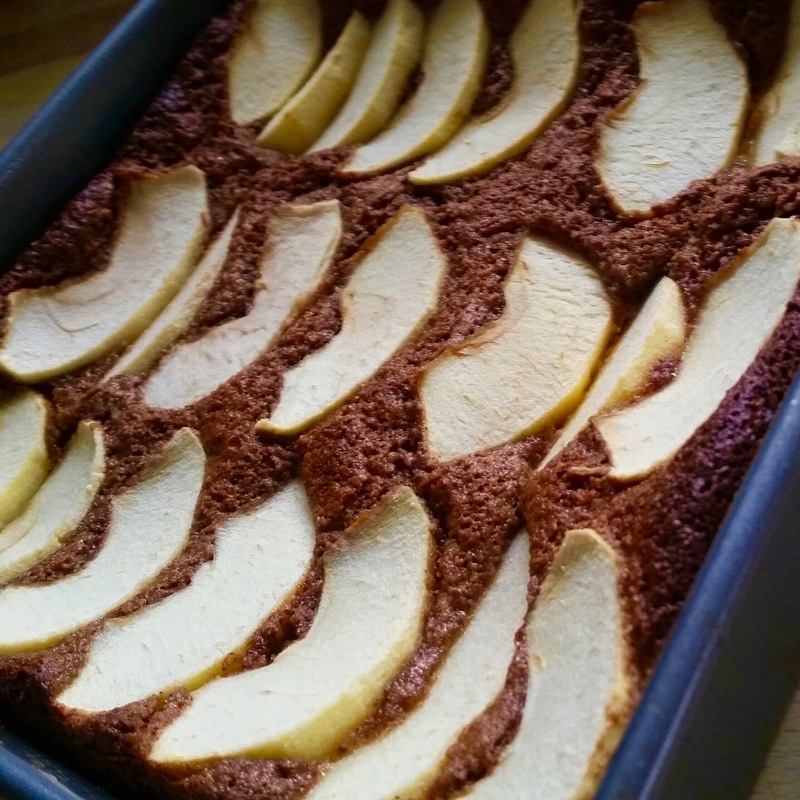 Just the other night when there was a double chocolate cake being passed around, I gave my mom a bite of my paleo apple cake. Not only did she think it was delicious, but she then asked to take some home with her. Yea, it’s that good. 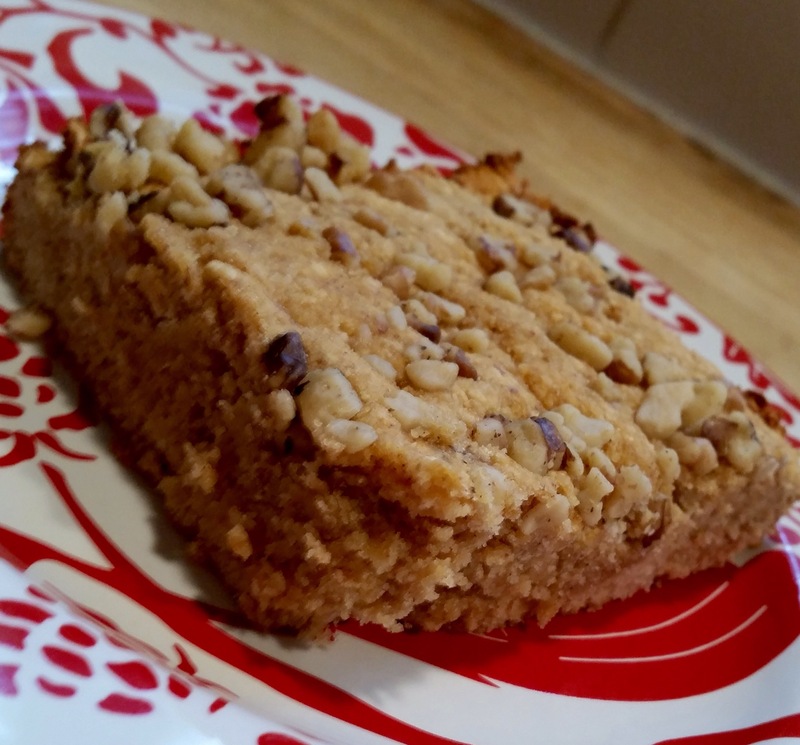 Anywho, this recipe will relieve your sweet tooth craving and use up some of those over ripe bananas. Win win! 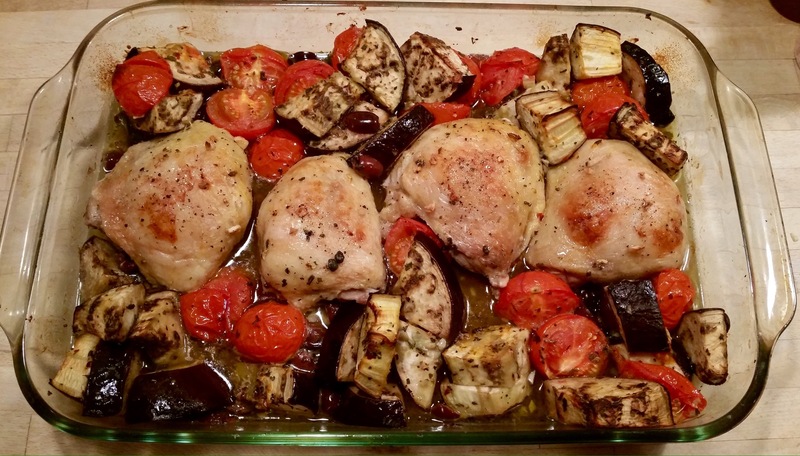 Ok, probably not actually “caponata”, but a delicious combination of flavors that fill the house with an incredible aroma. My sweet pea decided to not nap at all today, so as soon as the hubby got home from work, I jumped on the opportunity to hand off the baby and run out to the supermarket. I had no clue what I was going to make, but the chicken thighs were on sale so I went with them. The frigid snowy weather has me longing for summer flavors so I gravitated towards the tomatoes. While tomatoes may not be in season, Campari tomatoes always seem to do the trick. Added an eggplant to the basket and then headed home so figure something out. Wow, this was simple to prepare and tasted scrumptious! It’s snowing here and well below freezing, brrr! I didn’t want to venture out on the roads so I decided to bake a cake since I was stuck at home with my little one! The house now smells fantastic and I got some quality time in with my baby girl. She is refusing naps lately and therefore she is very cranky. I may have found a solution to entertaining her – singing very loudly and dancing while she watches me bake! At a little over five months old, she is still EBF. She is starting to show some major signs that she is ready to try solids. I took the opportunity today to see what she would do with a peeled hunk of apple, and boy was the result adorable!